Non-Destructive Metallography Used On-Site, Possibilites and Experiences. J. Vagn Hansen - FORCE Inst., Denmark. Testing of materials properties is usually a discipline for the quality assurance during manufacturing processes. However for critical applications a verification is often specified to be made late in the assembly or erection phase of a project. Tests on finished or almost-finished components may preferably be non destructive. In condition monitoring, certification or upgrading of existing plants and in failure analysis similar benefits from non destructive testing of materials properties can be achieved. Another benefit from the Non Destructive Metallography is that the test can be made on-site. As such they can also be used as follow-up e.g. to identify a defect found by another NDT-method. In petrochemical plants as well as high temperature parts of power plants the microstructure will gradually decay. Components exposed to both high temperature and high stresses will over time deteriorate due to creep. By metallographical methods the actual condition can be monitored and any acute need for repair or the rate of inspection frequency in the future can be safely judged. Even though the judgement can be made on-site it will often be more efficient to take replica samples that is copies of the surface areas prepared for microscopy and bring them to the laboratory for evaluation. The preparation for evaluation of the microstructure will include several grinding steps with subsequently higher finish in each step followed by either mechanically or electrolytically polishing. The last polishing step will leave the surface with a mirror finish from which an etchants can develop the characteristics of the microstructure. Fig.1b: Example of application on a weld zone (12). A copy of the microstructure is taken by either a softened plastic film or by moulding with plastics or silicone rubber, see Figure 1. One of the great advantages of the replica technique is that efficient preparation and collection of copies can be made on site by skilled personal and the evaluation can be done in the laboratory with the best microscopes by qualified metallurgists. Further the results can be documented by photos, and the replicas stored for comparison with later retesting. Other applications of the replica technique can be to verify the resulting microstructure of a welding or heat treatment procedure. It is even possible to estimate if fires or other overheating events have caused unacceptable degradation e.g. in stainless steel equipment. Fig.2: The Krautkrämer DynaMIC based on the Equotip principle used on a power shaft. Fully testing for materials degradation due to overheating will often include a test of current mechanical strength. Basically mechanical strength can only be found by destructive testing. On the other hand one can get an estimation of the strength based on a relation between hardness and ultimate tensile strength. Several types of transportable hardness testers have been developed for on-site, non destructive testing. Some of these testers follow the standard principles for hardness testing that is Vickers, Brinell and Rockwell. Other testers use a related principle from which the results can be transformed into standardized scales through empirical tables. Table 1 is giving a overview of some of the available transportable hardness testers. Fig. 2 shows an example of an application of Equotip/Dyna MIC on a shaft. Judged on the restrictions (geometrical-) for use on components other than straight tubes and rods and flat plates. Automatic measurement of indentation area based on vibration frequency analysis. The equipment appears to be very hard to operate held in free hand. Rigid supports that secure perpendicular measuring angle and keeps the device steady during measuring cycle improve the results. Differences in the electronic device for calculations and presentation of results. Vickers measurements made by transportable equipment follow the standards known from stationary equipment. The Equotip/Dyna MIC measurements have a reference in ASTM A956-96 and VD1/VDE 2616/1-1994. Corrosion resistance, resistance to high temperature scaling and the strength of alloyed steels are all dependent on the chemical composition of the material. At present fully detailed analysis of the chemical composition can be made as laboratory analysis only. But as the samples can be as small as e.g. 5 x 5 x 3 mm the test may be non-destructive if the sampling does not affect the function of the component. If a verification of the alloy is sufficient and this can be achieved by less detailed analysis or perhaps by an estimate of the level of one or two alloying elements several non-destructive methods are available. Table 2 gives an overview of most common laboratory and transportable equipment. Any of the mentioned transportable/on-site methods will usually be sufficient to make PMI-tests. PMI stands for Positive Materials Identification. spectrometry +++2 ÷ None Only very small samples needed. Analysis Electron reflected radiation spectrometry +++2 (+)3 None Only very small samples needed. Highest accuracy is obtained when using known reference standards for correction. Can be estimated but accuracy lower than for other heavier elements. With inert gas shielding carbon may be detectable but accuracy usually poor on alloyed steel. To be removed on hardneable steels and on stainless steels. Some elements as molybdenum and chromium can be analyzed with high accuracy, most other element will generally be less accurately estimated. Depending on the actual set of isotopes in the probe. Both the equipment for on-site OES and x-ray fluorescence have facilities to present the result in several ways. Basically the results can be presented as percentage of detected alloying element that is a chemical analysis as usually presented. Secondly one can choose to sort on one or more elements and have a result as "similar" and "different". Thirdly the percentage of elements can be compared to a library of alloys stored in the memory of the equipment. The result can as such be presented as e.g. "matching 316 stainless steel" or as belonging to a group e.g. a Cr-Mo-steel. The Diamond Paper Rubbing technique is based on the fact that x-ray fluorescens analysis is incapable of detecting carbon, oxygen and hydrogen. Due to this the abrasive Diamond Paper will be "invisible" and the collected metal dust adhering to the paper can be analyzed. The main requirement for a reliable result is a clean surface that is free of oxides, paint, grease or surface layers differing from the "bulk" of the alloy. As an example even the dust inevitable left by emery paper will cause a false silicon content. The very useful characteristic of the Diamond Paper Rubbing is that the amount of sampled metal is practically nil. Only an mirror finished surface could be negatively affected as a visible dull spot will be left. By far our most extensive use of the replica technique is the systematic checking for creep damage in Danish and Swedish power plants. Positions selected on the basis of stress calculations and previous test results are checked during the yearly revision of the plants. Through years of practical experience and research work a procedure for residual life time estimation has been developed. This experience has been formed into a recommendation: Nordtest Method NT NDT 010-1991-05. In the early years replica examinations were used to extend the lifes of steam components that had reached the limit of design life at 100.000 hours. The life extension was obtained through systematic testing and repair of a few highly loaded positions. Most of these old plants are now technically outdated and closed, but new has been build designed for 200.000 hours using new alloys but also enabling higher temperatures. These developments mean that calculated stress and temperature condition still have to be verified by checking the actual rate of degradation. Very often the examination on microstructure is combined with hardness test. Furnace parts in petrochemical refineries and off-shore installations are other fields of routine replica examination and hardness tests. Specialized jobs has been done in Swedish nuclear power plants to verify the microstructure or to identify the type of defects indicated by other NDT-methods. Another field of application for NDM is failure analysis both to identify cracks that might be repaired and to locate an area of damage. Both minimizing repair and totally avoiding repair when a defect can be identified as harmless can lead to great savings. Fig.3: Shows a PMI test on a component from a Pharmaceutical Plant done by Diamond Paper Rubbing Technique. A requirement for PMI tests is more and more often seen in specifications for both high temperature alloys and stainless steels in petrochemical plants. As an example the stainless steel piping systems for a refinery and an off shore installation in Norway were specified to be PMI-tested. A percentage of all welds and items from each heat of steel were tested to verify that pipes were alloy type 316 and not type 304. At first the X-MET was used but due to low temperature on the site the job had to finished by taking samples with Diamond Paper. Others areas for PMI are critical components and piping in chemical and pharmaceutical plants and in food production equipment. If an audition on a new plant e.g. made by the authorities or insurance inspectors reveals that properly stamped identification is missing PMI can verify that no alloy mismatch has occurred. As such sampling for more extensive tests leading to repair and subsequent tests of the samples and NDT of the repair are avoided. The NDM techniques offer a possibility to detect materials damage in an early stage and by this prohibit dangerous and costly failures. Plants that are notoriously exposed to gradual degradation will be safer and live longer if areas of highest degradation rate is located and possible damage repaired at an early stage. Qualification of new plants and the documentation for it can be improved if alloy type and materials properties are confirmed by tests upon receiving or by testing during erection and assembly. An optimisation of residual life time estimates or condition monitoring can only be achieved if the "point of zero" is known. The replica techniques offers a possibility to obtain these informations if reference material is not systematically stored in archives. As for all NDT techniques the NDM requires both suitable equipment, detailed procedure specifications/instructions and qualified skilled personnel to perform the tests and evaluate the results. In the future it can be expected that the operators for these methods will be not only qualified by skills and experience but also through a certification like most other NDT-operators. "Evaluation of replica inspection results from power plants", Pertti Auerkari, VTT Manufacturing Technology, Espoo, Finland, Kjeld Borggreen, FORCE Instituttet, Broendby, Denmark and Jan Storesund, AF-IPK, Sweden. "Ikke Destruktiv Metallurgi", J. Vagn Hansen. Dansk Metallurgisk Selskabs Vintermøde 1996. Educational project on transportable hardness testers, DTU and FORCE Institute 1997, Pernille Tønder. "Alloy Identification in Critical Plant Safety", David Shipley, Stainless Steel Europe, June 1995. "PMI as a Naturing Inspection Methods for Process Plant and Equipment", David Shipley, Insigth vol 37 No 8, Aug. 1995. "Härteprüfung an metallischen Werkstoffen". VDI/VDE 2616-1994. "High Temperatur Components in Power Plants. 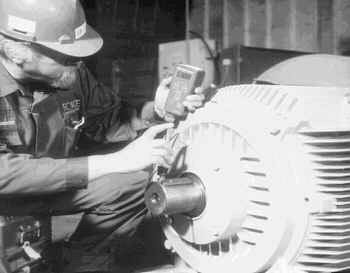 Remanant Lifetime Assessment, Replica Inspection", Nordtest Method NT NDT 010-1991-05, VDC 620.179.1. "Abdruckverfahren für die Oberflächenprüfung (Replica Technik)", DIN 54159-1977. "NDT-Metallographic Replica Techniques of Surface Examinations". ISO 3057-1974. "Emergency Standard Practice for Production and Evaluation of Field Metallographic Replicas", ASTM ES-12-87. "Non-Destructive Examination. The Replica Method for Inspection of Material Structures and Crack Detection", Per B. Ludwigsen, Structure 15/1987.